A tasty way to get your kids to eat their vegetables! Grate 1 cup zucchini using the large holes of a box grater, set aside. In a large mixing bowl, whisk together flour, baking powder, sugar, cinnamon and salt, set aside. In another large mixing bowl, beat together the eggs, buttermilk, melted butter and vanilla until combined. Slowly add the dry ingredients to the wet ingredients and beat until smooth. Fold in zucchini and mix well. Spray the waffle iron with non-stick cooking spray. 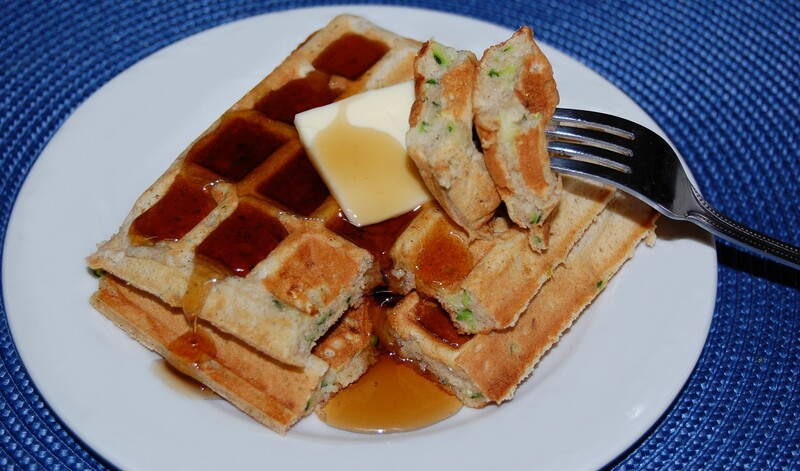 Pour about a 1/2 cup batter per waffle, onto the hot waffle iron and cook (according to manufacturer's instructions) until crisp. Top with butter and maple syrup, fresh fruit, or dust with confectioners' sugar. I added some chopped pecans and nutmeg. These waffles were great! 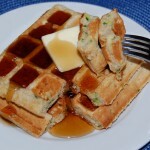 I knew I wanted to make zucchini waffles, I just needed a recipe. Some had way too much sugar, others not enough butter. Some barely had any zucchini. Yours looked just right. They cooked perfectly in the waffle iron too. Thanks for the tasty recipe!